Triple S offers a suite of software tools to help you workload your facility. Achieve Assistant is an easy-to-use program that allows you to quickly determine how many hours, and how much labor is required to clean your facility. Achieve Pro is a more advanced version and includes more analysis, detailed staffing plans, work assignments and more. An easy-to-use software tool that allows you to determine how many hours, and how many employees are required to clean a facility. Perform simple staffing requirements and provide labor savings analysis. ROI Calculator - Calculates your return on investment when using Triple S floor and carpet care equipment. A powerful, software tool for developing a complete custodial staffing plan that includes labor, work assignments, inspections, and more. Based on INFORMED Cleaning Management Software. More intensive program; in depth analysis of larger facilities. Multiple Modules included: Space Management, Area Types & Tasks, Labor Estimates, Work Assignments, Inspections, Supplies and Equipment Assessment & Inventory Management. GHS stands for the Globally Harmonized System of Classification and Labeling of Chemicals. The U.S. Occupational Safety and Health Administration (OSHA) adopted GHS to standardize and harmonize the classification and labeling of chemicals to give universally understood warnings to users. GHS affects any company that has hazardous chemicals in the workplace. Employers with hazardous chemicals must ensure that they have safety data sheets and labels for their exposed workers and that they are trained to handle the chemicals properly. Your local Triple S distributor can assist you with compliance on GHS and other OSHA regulations such as dealing with Bloodborne Pathogens. For more information on GHS, please watch the videos below. Whether it’s MRSA, C.diff, or bird flu, Triple S has the products, processes and training to provide the safest outcomes. 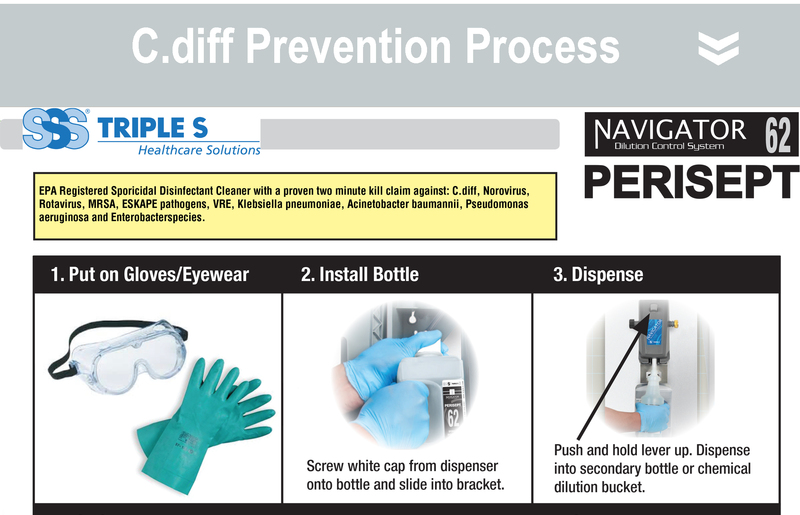 A range of disinfectant and hand hygiene programs coupled with our comprehensive training programs delivered by our nationwide network of distributors. Should an infectious event occur, lean on the resources of Triple S, your team of experts, to provide a quick and accurate recommendation. If you are interested in having a training session conducted at your facility or learning more about training opportunities, please complete the form below. Membership is available in select markets to full-line distributors with a focus on jan-san. For more information, please complete the form below. If you have a product or service that would be of interest to our Members, we'd like to hear about it. Please keep in mind that by completing this form does not guarantee that your company will become a supplier to Triple S. If an opportunity exists we will contact you.